Hope you all had a terrific weekend! Hopefully it wasn't as hot where you live as it was here in Northwest Arkansas. It reached a whopping 97 degrees on Saturday...ick! Ok, so last week sweet Amber of Southern Chic Designs approached me about doing a giveaway for one of her gorgeous items! She even let me choose which one I wanted to gift y'all with! SC's designs range from bohemian to shabby chic, all while having an aire of Southern charm about them. 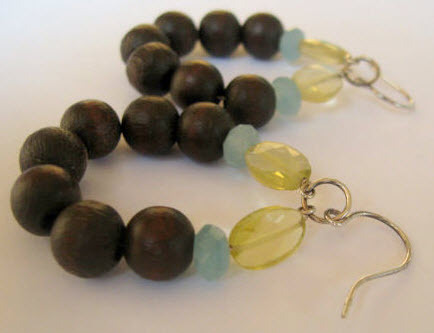 Some of my favorite pieces were the Wood Bead Hemimorphite and Lemon Quartz earrings, the Turquoise and Coral bracelet and the Acai Seed Necklace with Leather Tie. ...that's what one of you lucky readers will win! 3. 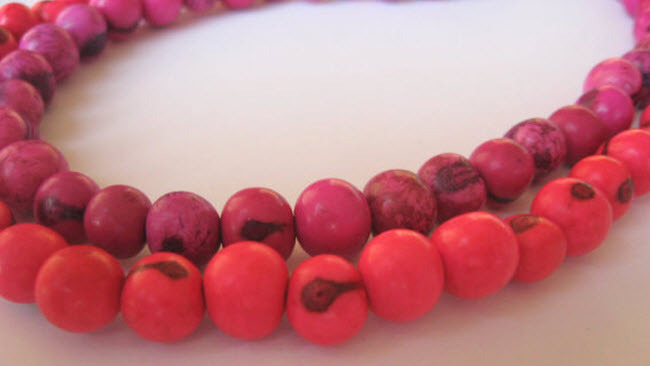 Tell us what you'd pair the Acai Seed Necklace with! A maximum of three entries per person. Only open to residents of the United States. Participants must be entered by Monday, June 27th at 9:00 p.m. CST. I will choose the winner using Random Number Generator and will announce her on Tuesday morning, June 28th! Get to it, Blonde Ambitioners! I don't have my own blog (although I do follow you in Google Reader)...if I won, I would pair it with a dark, solid tee (maybe brown) and a cute summer skirt and sandals. I would pair that necklace with my black maxi dress..the color would totally pop! Follower of both :) And I would pair it with a white cotton shirt and jeans or linen pants by the water! I now follow Southern Chic Design's blog! I would pair this with jeans and a solid top of pretty much any color. gorgeous! I follow both! If I win I would pair it with my white jcrew skinny jeans (perfect for chilly summer nights) and this top http://bit.ly/jV7Ss1 in black! Gorgeous necklace! I would pair it with an all white outfit! I follow you too so i suppose that is 2 entries! Follower of both you lovelies:) I'd pair this beautiful necklace with a white summer dress!!!! I'd pair it with a white tee and some type of brown bohemian type skirt. There are so many ways to wear this necklace, but I think for summer I'd go with white skinny jeans & a navy top or my black maxi dress - anything to let the color pop! I follow A Blonde Ambition and LOVE all your posts! I am now a follower of Southern Chic! I have a cute dress that I could put this with, but also a cute pair of blue jean colored linen capris with a white top would really make it pop! I'd wear it with some great jessica simpson wedges and linen pants! I would wear that gorgeous necklace with EVERYTHING! I'm also following Southern Chic Designs blog! I would pair this necklace with this chocolate brown dress I have from jcrew! I'd pair it with dark skinny jeans, a white tube top and cowboy boots! That way with a tube top neckline it'd have nothing to compete with! I follow Southern Chic Designs! I'd pair it with my black dress, white tee with my cute pink print capris or black RL top and capris! I just followed the Southern Chic Design blog. What beautiful jewelry. I'm a follower of A Blonde Ambition! I would dress up my myriad of black tshirts with the Acai Seed Necklace! I follow A Blonde Ambition! I have a maxi dress that would work perfectly with this necklace! 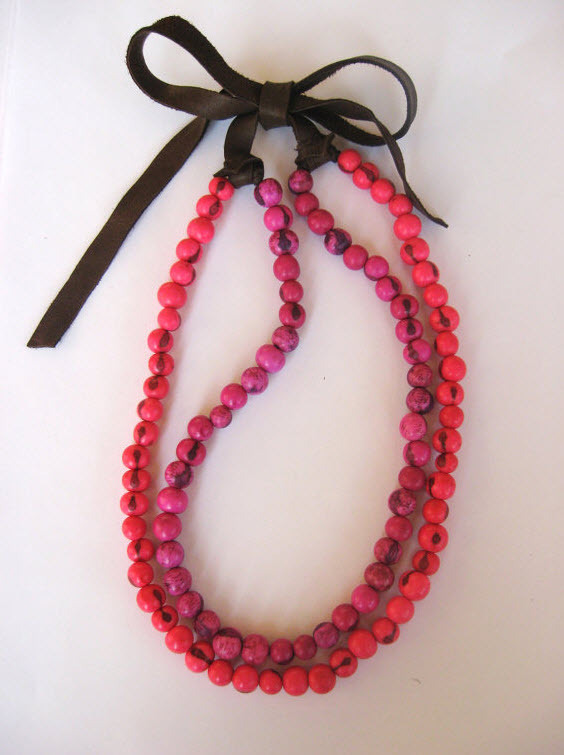 Following both of your blogs, and I'd wear the acai seed necklace to the beach with a loose sundress! Also, I have a giveaway going on at my blog right now if you're interested! I'm a follower and I'd pair it with my favorite black scoopneck dress and wedges! I follow southern chic's blog!!! I would wear it with a cute cotton black dress I have from loft! I would pair that necklace with a simple white shirt and brown shorts! I Follow you :) What a fun giveaway! I follow blonde ambition!! Girl I live in SC and we are already seeing temps in the 100s. I would pair the necklace with the Red Coral Chandelier earrings. I'd pair this with a maxi dress that has pops of red in it. I'm a follower of your blog as well. Thanks for the chance to enter"
And I actually just got a dress--strapless, turquoise blue with white, tan and the exact colors in the necklace on it! Really cute necklace! I follow Southern Chic Designs! I would pair this with solid tee of any color, maybe lime green for fun! I would pair the necklace with simple jeans and white t-shirt and pair of platforms. And I follow your blog, of course! I would wear it with anything b/c it would go with anything! I follow your blog... and hope cute would that necklace look with just dressy jeans and a white shirt...and a tan? I love it! I also just started to follow southen chic... love all of her things! I now follow Southern Chic! I would wear the neacklace with a fun dress for my daughter's first birthday party - it would match the colors we are using perfectly! And now I follow her! And I would pair the necklace with a crisp white collared shirt, my jeans and cowboy boots! I am a follower of both blogs! Now then what would I wear the jewlery with.....I have a great white short strapless ilet style dress that would be perfect with any of the pieces especially either of the necklaces!!! Throw on some cowboy boots and a denim jacket and viola! I am a follower of both blogs now!! I have fabulous navy ruffled tank, white shorts, and super cute wedges that I would pair this lovely little necklace with if I won!! I am also follwoing Southern Chic Design's blog. 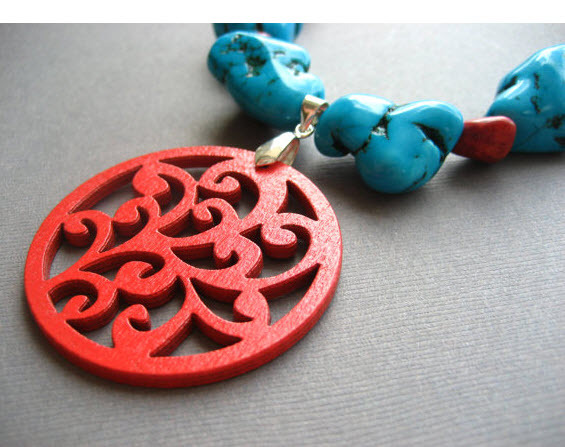 If I won, I want that turquoise and red beauty in this post...I am LOVING that color combo! What a gorgeous necklace! I'd pair it with a white tunic and leggings so that the color can just pop! It's so pretty not to draw the most attention possible to it! I follow your blog of course. xo.